Just before Jesus ascends into heaven, He tells His disciples, "Go ye therefore, and teach all nations, baptizing them in the name of the Father, and of the Son, and of the Holy Ghost." AR UP IN Galilee, away from the reach of their enemies, a group of men and women met together on a mountain-side and waited for the appearance of their Lord. And Jesus came to them there, and talked in other days. And they rejoiced to see him once more and worshiped him; but some doubted that he was really the same Jesus who had been nailed to the cross. One day after this meeting some of the disciples who had been fishermen returned to the Sea of Galilee. The familiar sight of the water and fishing-boats floating about on the surface stirred within Peter's heart a desire to again go fishing. So he told his companions, and they said, "We will go with you." John, the disciple who often went with Peter and James, now whispered to his companions, "It is the Lord." And immediately Peter wrapped his fisher's coat about his body and jumped overboard to swim to shore, so eager was he to come to Jesus. The others remained in the ship and brought it to the landing. Then Jesus commanded them to bring some of the fish they had caught, and Peter drew the net from out of the water. In it they had taken one hundred and fifty-three large fishes, yet the net was not broken. 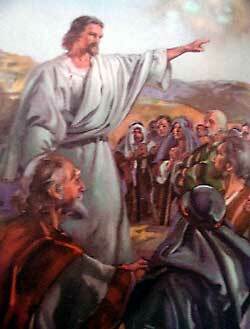 Then Jesus asked the men to come and eat, for he had already prepared fish and bread on the burning colas. After they had eaten, Jesus talked with Simon Peter, the disciple who had denied him at the time of his trial. He asked Simon three times if he loved him, and each time Simon replied, "Yes, Lord, you know that I love you." Then Jesus told Peter words like these: "When you were a young man you went wherever you wished, but when you shall become an old man you shall stretch out your hands and another shall carry you where you do not wish to go." Then he said to Peter, "Follow me." Simon Peter turned about and saw John standing by. At once he asked, "Lord, what shall this man do?" But Jesus said, "Never mind about John's work; see that you follow me." During this time Jesus appeared to his disciples and "when they saw him, they worshiped him: but some doubted. And Jesus came and spake unto them, saying, All power is given unto me in heaven and in earth. Go ye therefore, and teach all nations, baptizing them in the name of the Father, and of the Son, and of the Holy Ghost." While they talked earnestly together, Jesus said, "John the Baptist baptized you with water, but you shall be baptized with the Holy Spirit in a few days." And some of the disciples asked, "Will you at that time restore the kingdom of Israel?" But Jesus said, "It is not for you to know the plans of the heavenly Father; but you shall receive power from heaven when the Holy Spirit comes upon you, and this power will cause you to witness boldly to me in Jerusalem, in all the country of Judah, in Samaria, and in the farthest parts of the world. But do not go away from Jerusalem until the Holy Spirit is given to you." Then two angels came and stood beside them, clothed in beautiful garments of white. They said, "Men of Galilee, why do you stand gazing up into heaven? This same Jesus who is taken up from you into heaven will come again in the same manner as he went away."